History of the Jews in Switzerland reaches back at least a thousand years. Jews and Judaism have been present in the territory of what is now Switzerland since before the emergence of the medieval Old Swiss Confederacy in the 15th century. Switzerland has Europe's tenth-largest Jewish community, with about 17,500 Jews, roughly 0.2% of the population. About one-third of the Jewish community lives in the Zürich metropolitan area. As of 2009, there were 38 synagogues in the country. 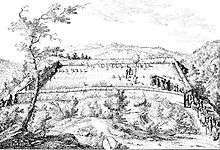 1754 drawing of the Jewish cemetery in Endingen by Johann Caspar Ulrich. A ring with a Menorah depiction found in Augusta Raurica (Kaiseraugst, Switzerland) in 2001 attests to Hebrew presence in Germania Superior. The Encyclopaedia Judaica mentioned a first documentation in 1214. In the Middle Ages, as in many places in Europe, they frequently suffered persecution, for example in 1294 in Bern, when many Jews of the city were executed and the survivors expelled under the pretext of the murder of a Christian boy. 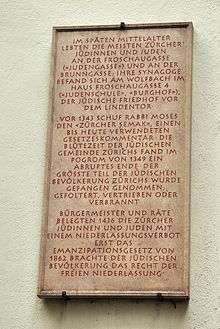 Another pogrom occurred among other cities in Zürich in 1249; at the location of the former synagogue at Froschaugasse 4 in the former Neumarkt quarter, a plaque was mounted. Jews were banished from Swiss towns in the 1620s, and from 1776, they were allowed to reside exclusively in two villages, Lengnau and Oberendingen, in what is now the canton of Aargau. At the close of the 18th century, the 553 Jews in these villages represented almost the entire Jewish population in Switzerland. An important source for the situation of Swiss Jews in the 18th century is the 1768 Sammlung Jüdischer Geschichten by Johann Caspar Ulrich. Beginning in 1603, the deceased Jews of the Surbtal communities were buried on a small Rhein river island, the so-called Judenäule ("Jew's island") which was leased by the Jewish community. As the island was repeatedly flooded and devastated, in 1750 the Surbtal Jews asked the Tagsatzung to establish a cemetery in the vicinity of their communities in the Surb valley. Once a year, the communal chevra kadisha (hevra kadishah, Aramaic: חברא קדישא, Ḥebh'ra Qaddisha, meaning "holy society") visited the graves on the island. In 1750 the Tagsatzung 'allowed' the Jewish communities of Endingen and Lengnau to acquire woodland on a small hill between Endingen and Lengnau to establish the Endingen cemetery. The cemetery has been expanded several times; based on an 1859 agreement, two-fifths of the cemetery belong to the Israelite community of Lengnau, and three-fifths to the Israelite community of Endingen. In accordance with the resolution of the Tagsatzung in 1678, Jews were allowed to settle in the communities of the Surb valley. After 1776, they were further restricted to living in only Endingen and Lengnau. This immigration slowly but steadily changed the appearance of the communities. 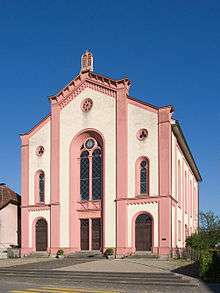 The village of Endingen never built a Christian church, only a Jewish synagogue. The local Christians traveled to neighboring villages for church. Jewish and Christian families were often under one roof. However, the Jewish resident were only allowed to enter a few professions, such as trade. Houses were built with two separate entrances, one for Jews and one for Christians. They were under the high and low courts of the Baden bailiff and had to buy "protection and safety" letters from the authorities. In 1798, the French under Napoleon I invaded Switzerland and set up the Helvetic Republic. 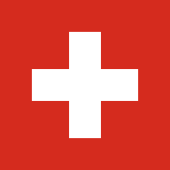 The Republic attempted to modernize and centralize the Swiss Confederation. As part of this new, liberal state, Swiss reformers attempted to enforce the emancipation of the Jews in the new central Swiss Parliament in Aarau. When that failed, they attempted to get the French to force this change on the new Swiss government. The changes of the Republic were not embraced by many of the Swiss and the issue of emancipation for the Jews became another contentious issue between the old order and the new government. Finally in 1802 the population revolted and turned against the Jews. The mob looted the Jewish villages of Endingen and Lengnau in the so-called Zwetschgenkrieg ("Plum war"). At the same time other revolts, such as the Stecklikrieg, stretched the French Army too far. Napoleon lacked the troops to bring peace to Switzerland, and also he needed the Swiss regiments for his campaigns. Seeking a peaceful resolution to the uprising, in 1803 he issued the Act of Mediation. The Act of Mediation was a compromise between the Ancien Regime and a Republic. One of the compromises in the Act was that no further rights were granted to the Jews. By the mid 19th century the village of Endingen had about 2,000 inhabitants, about half Jews and half Christians. By comparison, the town of Baden had about 1,500 people at the same time. The Jewish population was fairly well tolerated, self-managed and maintained its own school. 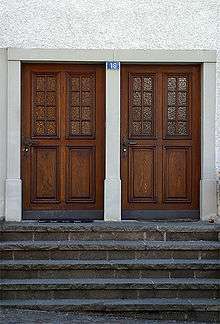 In 1862 the Jewish community of Zürich, the Israelitische Cultusgemeinde Zürich (ICZ) was founded, and in 1884 the Synagoge Zürich was built at the Löwenstrasse road. In 1879 a Jewish village of Neu-Endingen was built. It remained mostly independent until 1983 when it merged back into the village of Endingen. The right to settle freely was not restored to Jews with the Swiss constitution of 1848, and was only granted with the revised constitution of 1874. Article 49 of the 1874 constitution guarantees the freedom of religion. In 1876, the Jews were granted full equality in civil rights and allowed to travel. By 1920, most Jews had left the Surb Valley. During the late 19th to early 20th century, many Jews from Alsace, Germany and Eastern Europe added to this core group. In 1920, the Jewish population had reached its peak at 21,000 people (0.5% of the total population), a figure that has remained almost constant ever since. Jews living in the Surb Valley once spoke a dialect of Western Yiddish, traces of which can be still found today in the region. Western Yiddish is mainly a mixture of High German dialects, with Hebrew and Aramaic words, and inklings of Romance languages, distinguished from Eastern Yiddish in that it has far fewer Slavic loanwords (see Yiddish). Unlike Eastern Yiddish, which is spoken to some degree by Polish and American Jews, Western Yiddish has almost disappeared. Today there are only a few, mostly elderly Jews who know the dialect of the Surb Valley Jews, and the Sound Archives at the University of Zurich have begun recording what is left of the dialect. According to the 2000 census, the Jewish population of Switzerland was at 17,914 (0.2% of the total population). Although the number of Jews has remained fairly stable since the thirties, their percentage of the Swiss population has fallen considerably. This plateau is due to immigration, without which Swiss Jews could not have prevented a demographic setback, linked to an aging population and the many mixed marriages. Among the Cantons of Switzerland, only Zurich, Basel-City, Geneva and Vaud have a Jewish community exceeding 1,000 people. One third of Swiss Jews reside in the Canton of Zurich (6,252 people). ↑ Hein, Avi. "The Virtual Jewish World — Switzerland". Jewish Virtual Library. Retrieved 12 December 2015. ↑ "Auf den Spuren der mittelalterlichen Synagoge von Zürich: Archäologische Untersuchungen im Haus Froschaugasse 4." (in German). Stadt Zürich. 2002-08-08. Retrieved 2014-10-30. ↑ Andreas Steigmeier (2008-02-04). "Judenäule" (in German). HDS. Retrieved 2015-12-17. ↑ "Jüdischer Friedhof Endingen / Lengau (Kanton Aargau / CH)" (in German). alemannia-judaica.de. Retrieved 2015-12-17. 1 2 3 Endingen in German, French and Italian in the online Historical Dictionary of Switzerland. ↑ "Die Israelitische Cultusgemeinde Zürich (ICZ) und ihre Synagoge in der Löwenstrasse" (in German). alemannia-judaica.de. Retrieved 2015-01-25.